impromptu off the cuff copycat contest time. the same and different. same: contribute to the world's longest poem at choka on it by adding a 7-5 couplet *that flows* from the one preceding yours (HOWTO: here, please read if its new to you), and copy/paste your couplet in the comments to *this* post. if in doubt, check out my past choka contests here and here for what i mean. different: i don't have the prize. YET. 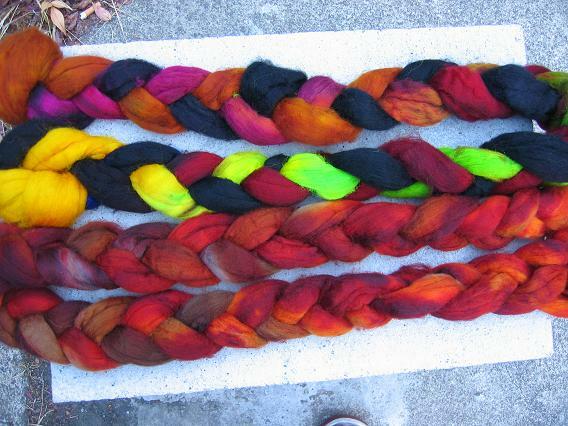 lately i've been on a total kick supporting my LYS article pract, so i can kill two birds with one stone... winner will give me an idea of preferred colors and i'll send them 2 skeins of koigu i'll pick out for them from AP's koigu stock on hand. 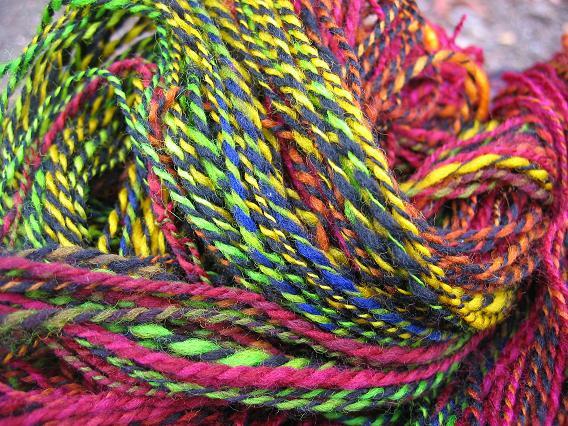 (or, 2 skeins of ryc cashcotton, 2 skeins of lorna's laces shepherd sock, louet gems pearl, cascade sassy stripes, regia silk or regia bamboo or regular ol' regia... those are the ones i can remember off the top of my head.) whatever. sock stuff though-- its socktoberfest! i don't know the colorways offhand so you'll have to trust me (but winner is welcome/encouraged to give me an idea of their likes/dislikes and pray i don't embarrass myself.) i *may* get over there sooner and take a pic of the koigu they have (yeah, all kinds of crazy over here!)... not sure if its in the cards or not though so you may just have to trust me. i'm planning on scooching over there not this weekend (*nothing* can touch this weekend), but next (going to check out some cashcotton 4-ply for anne's new MANlace pattern, meow!)... so let's say we'll run the little contest til november 10 (friday) in the early afternoonish. 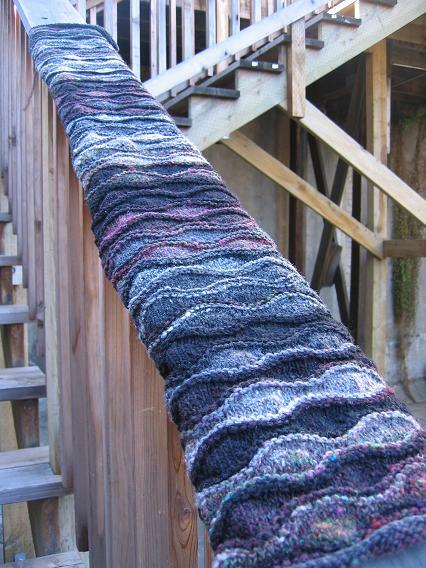 really different: all yall who liked the hitchhikers guide to the galaxy yarn? bat f*cking crazy. (i can say that, its halloween yall!) you want it? you got it. in your comments when you add your couplet, tell me you want to be entered in a seperate draw for the H2G2 yarn as well (you'll be entered for the koigu, too), and i'll draw a name from that much smaller pool for the crazy person i'll inflict it upon. no setting it on fire if you win though, i can do that here. don't feel obligated to take it/throw yourself in the hat for it... believe me, i UNDERSTAND. 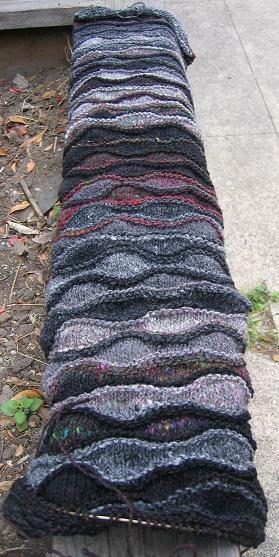 i'll spin up the second bit of roving to complete the set, good practice for me (great advice kristin)! i'd GUESS there'll be enough for a pair of socks with 2 skeins, but! 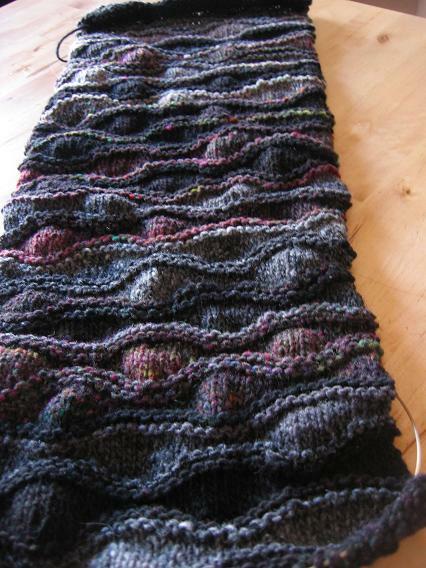 there's a bunch of knots in the 1st skein (like, at least 6. seriously. 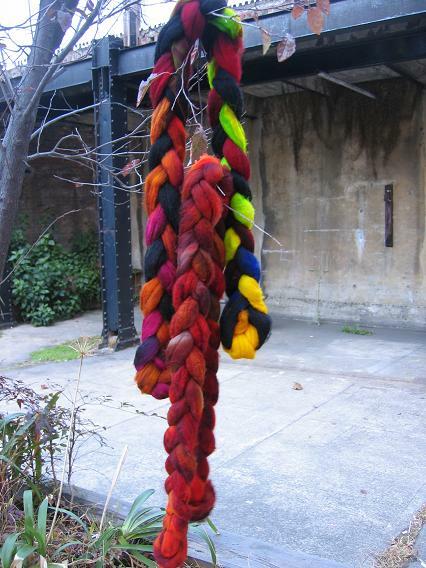 i'd be super po'd if i had that many knots in a 50gm skein!) and will be some in the 2nd ;) ... remember its superwash, no spit splicing! it may take me a bit to wrestle the time together to spin up the second hank too, but i'll have it done sometime soon for the winner of that little offshoot. okay! have at it! happy socktober, the best month ever. I think its usually better to start with the good. 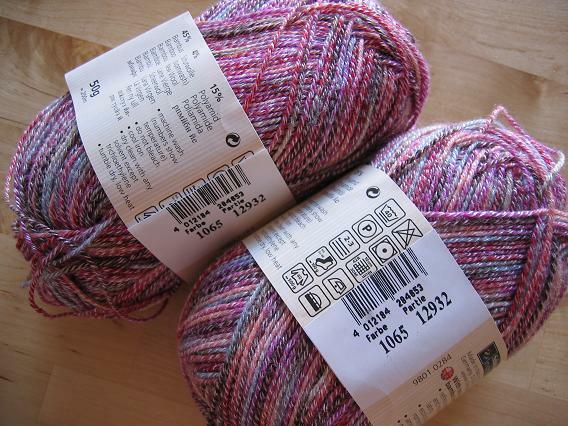 At best, at the very very best, I am ambivalent about this yarn. At medium spin cycle I dislike it. And at the extreme end where I tend to spend my waking hours, I hate this with blind fury. Its... ugly. Garish. Its kinda like the H2G2 movie-- starts out like a good idea but when you get into it, its just a mess and you want to like it (really really want to), but oy. Kinda like that. The fact I "wasted" part of my weekend with it, instead of working on Lizard Ridge, chaps mah hide too. 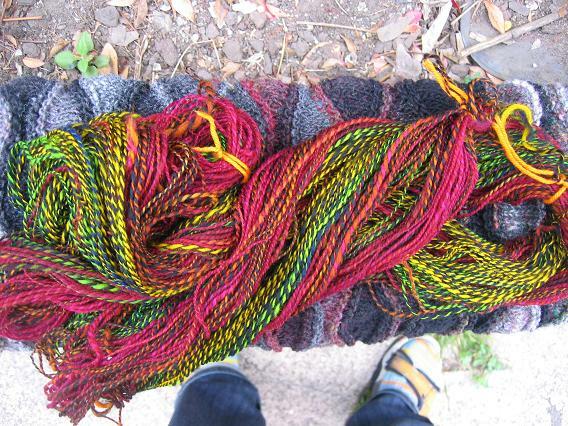 I feel guilty almost, hating my own handspun. I can't imagine using it, except maybe to subject my son to a crazy hat or something that he wouldn't wear anyway. Oh yeah. The best part? Knots. I had fewer of my singles breaking this time (a miracle happens when the lazy kate on the joy is cleaned & oiled!)... 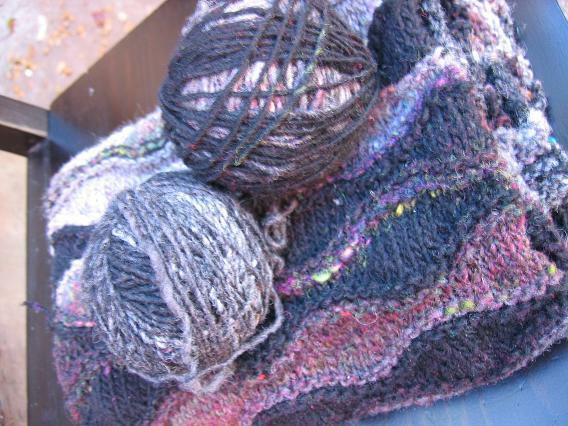 but still had floaty breaky bits of underspun singles and when they happened along and fell apart, I just tied them together with the yarn into a knot and kept spinning. What *do* spinners do when you plies break? If this wasn't superwash I'd just join them and be on my merry way, but I couldn't think of what to do. The scope and size of this project is near to impossible to shoot. Every time I see a lizard ridge square (or panel like mine), they just don't visually give you that, "my goodness is that huge" vibe. They're about 10.5" across, and come up to my neck from the floor. Even still, I need to figure a better way of taking these progress shots :) I tried photographing them inside, but my son *loves* these panels... runs on them, plays with the ridges between his toes, has decided he no longer needs train tracks and these will do kindly for the Thomas collection thankyouverymuch, etc... Pray for me when I have to seam this sucker together. 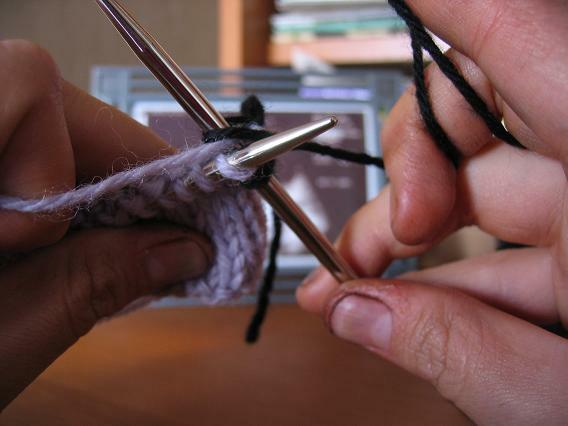 Another reason to love the "weaving in ends while you knit" thing I just posted about? I did lay these panels side to side and the older panel, which has stranded yarn along the edge for the color changes in the rows, puckers. As lightly and as loosely as I stranded that yarn along the edge (with an eye to keep it "non-floppy"), compared to the panel where I wove in each end as I went it is puckery... so much so that when I laid them together, I thought I'd overknit the new panel since it was a few inches longer than the older panel. It will work out when I block it and seam it (I hope! 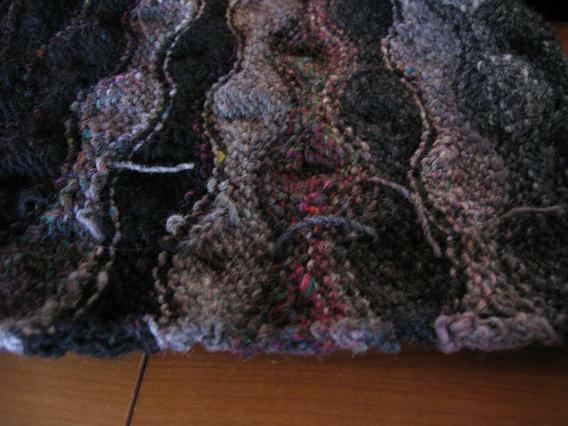 ), but its another reason to rejoice that I don't have to worry about weaving in ends anymore. Trees. Not just for yarn anymore. From "Ender's Game" by Orson Scott Card. I am on the last book of the entire Ender series (finished the Shadow series, finishing the Ender series with Children of the Mind as I type). I'd read them all before (except Shadow Puppets and Shadow of the Giant, both of which weren't released when I'd read the series before.) In the first book, Ender's child army was "Dragon"-- the colors? Grey orange grey. I was playing with mottling the grey within the orange and it didn't stand out (obviously)... only tiny bits of grey stand on their own. 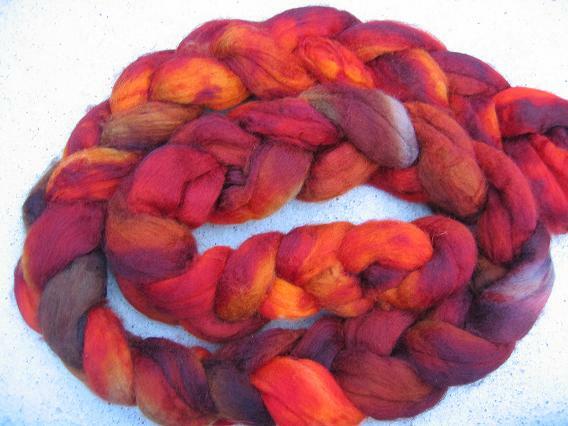 Seeing it dry I was tempted to call it Dune, but I have another colorway in mind for that one (I've been devouring my scifi shelf lately!) I still love it, I really love this color. Later I will dye more roving using the same colors and try to allow the grey to stand on its own, but for now I love this quite a bit. How could I resist? 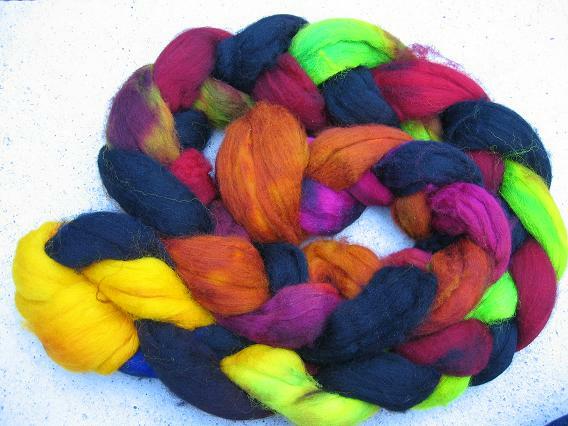 :) I'm curious to see how this will spin, a good chunk is black with all of those bright colors dyed in sections. Even though I think I prefer spinning from the fold, I may try and attempt long draw next time to keep the colors together and 2-ply them for some crazy color barberpoling action. 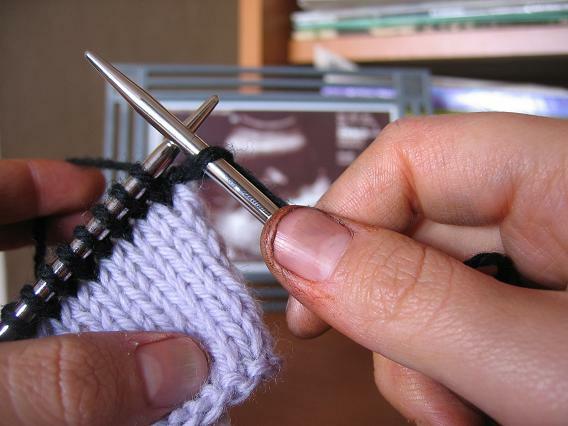 While holding the yarn as described above, insert your working needle into the 2nd stitch on the needle as if to knit it normally. 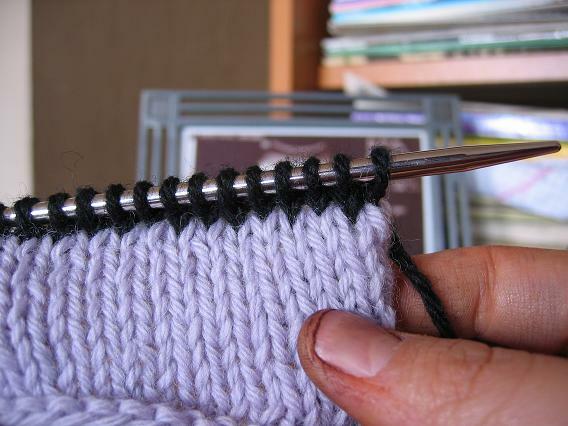 Take the end of the old color (purple) and lay it across the top of your working needle (counterclockwise fashion, the OPPOSITE of how you would wrap your working yarn to make a stitch.) You're just laying it on top of the needle and holding it there w/ your left hand. 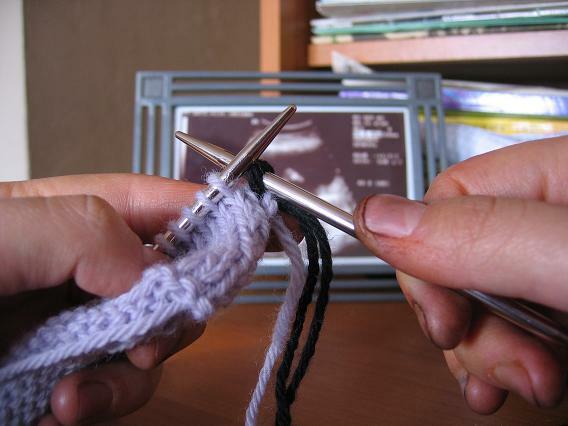 Another view of laying the end yarn over the working needle. Notice its just draped across. 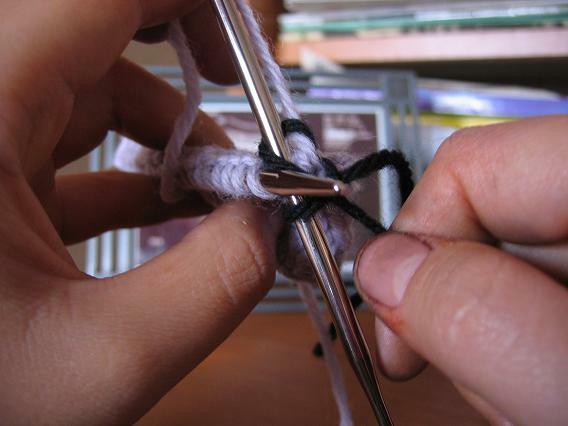 Now, while holding the end yarn in place as described above, knit a stitch with your new color (black). 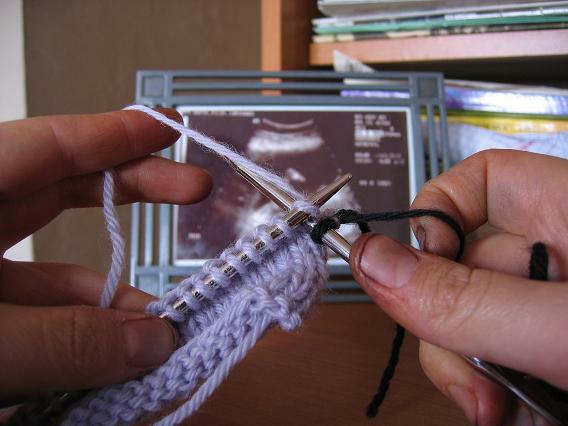 Note that the knit stitch is wrapped the OPPOSITE way that the end yarn is wrapped. 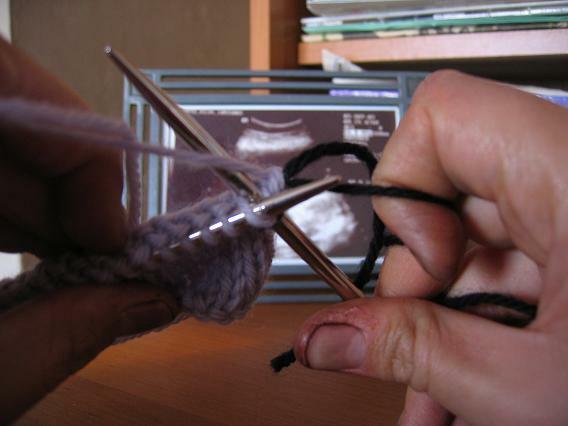 Another view of knitting the 2nd stitch on the needle with the end yarn draped over the working needle. 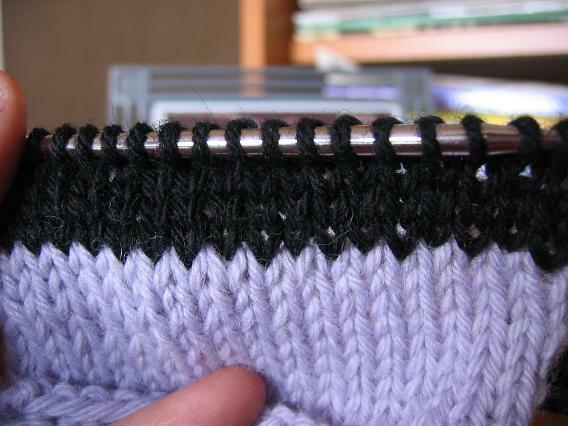 Pull the working yarn (black) thru as knitting a stitch normally. 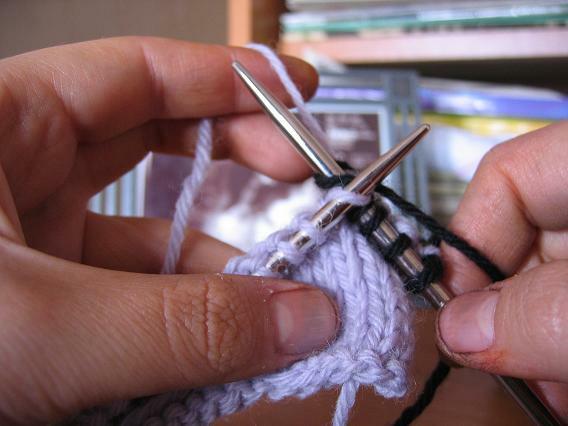 Note that the stitch is not only being knit, but the working yarn is "catching" the end yarn and going under it to create the stitch. 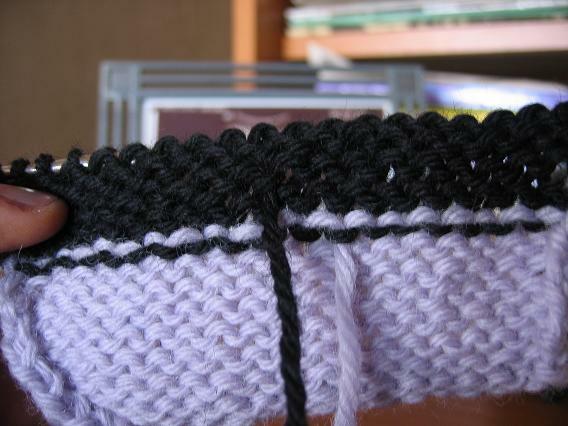 Only the working (black) yarn will be pulled thru and made into a stitch. 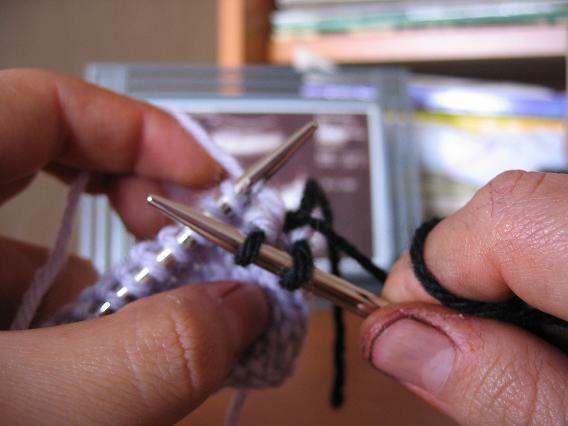 This is what the 2nd stitch on the needle looks like, as the end yarn is woven in behind. 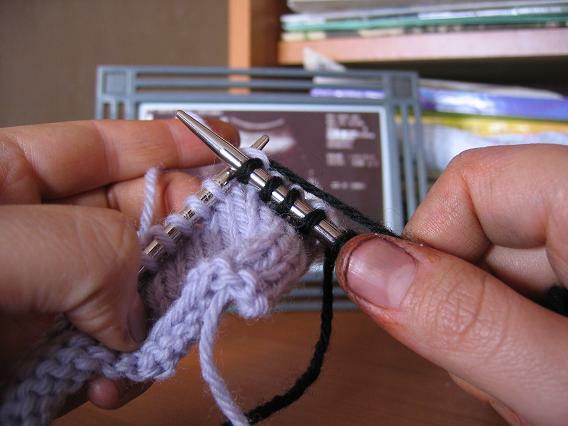 While still holding the end yarn in the left hand, knit a stitch with the working yarn normally. 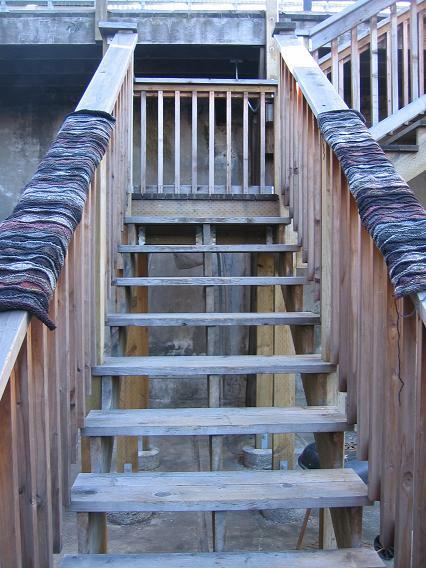 (You don't have to do anything "special" on this step except for retaining the end yarn in your left hand.) 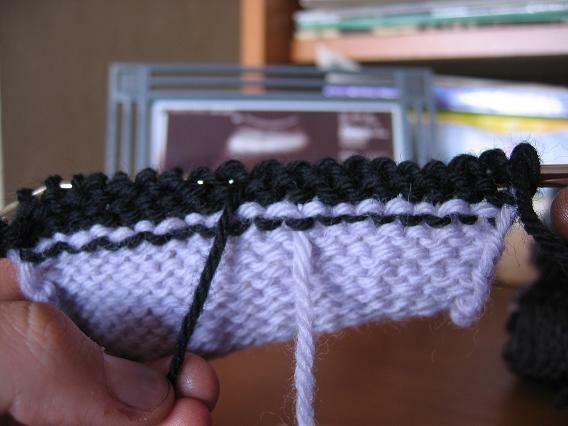 The working (black) yarn will go over the end yarn to "hold" it down and make it point downwards. (Second view.) 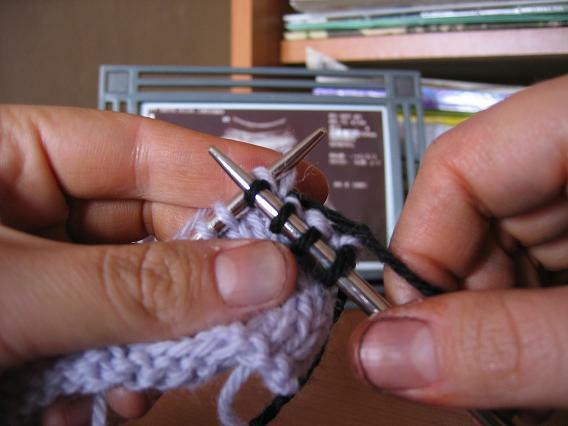 How the 3rd stitch on the needle looks, as the stitch is worked normally as described above. What 3 stitches look like with the end woven behind the latter 2 stitches. The following pics are a repeat of the process above as I work across the row. 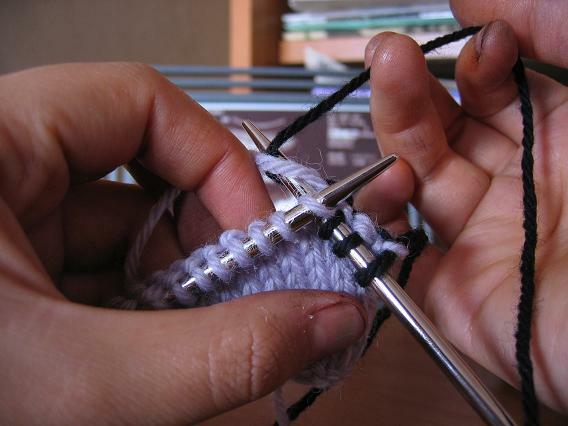 Again, lay the end yarn over the working needle in a counterclockwise direction, and knit the stitch with the working yarn as normal. 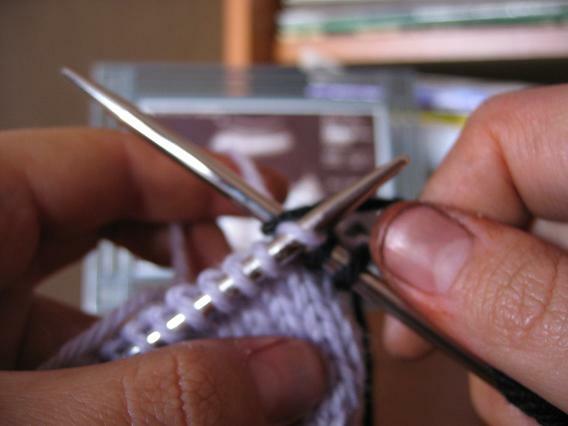 The end is woven in as the working yarn makes its stitch. 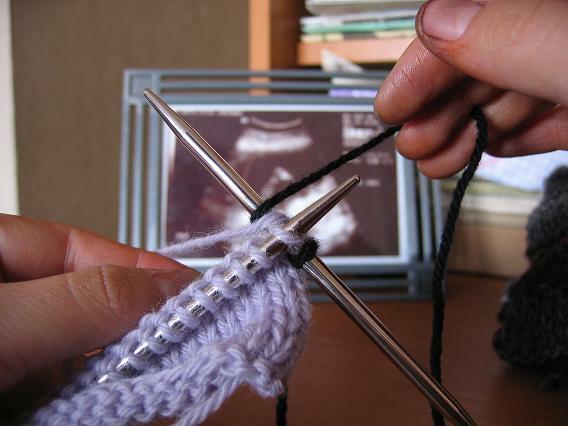 The working yarn makes a stitch as normal, and in the process "locks down" the end yarn that's being held in the left hand (but isn't being draped across the needle now). Here I've woven in the end of the yarn over 10 stitches + 1 (5 pairs of weaving & locking, plus the original 1st knit stitch). 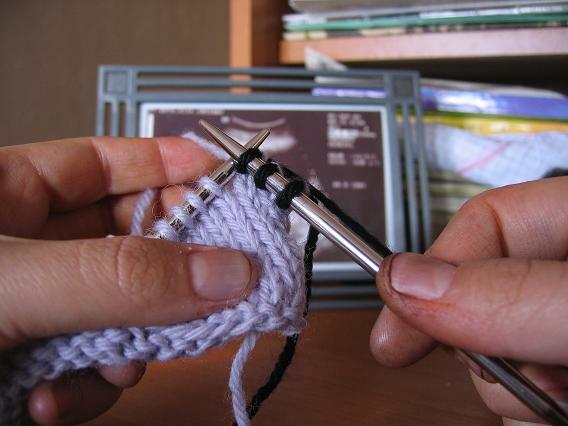 After the end is woven in to your desired length (and after a pair of weaving/locking stitches), you just drop the end and knit across as normal. 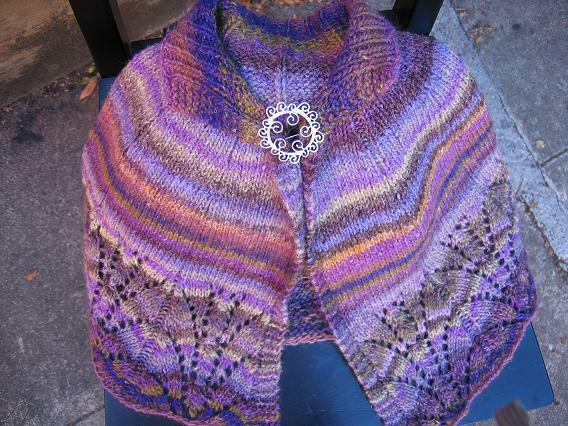 This pic is of the WS after knitting/weaving across one row. If you look *super* close, you may be able to see where the end yarn (purple) is doubled-- every other "purl" bump on the WS will have a "double" bump where the end yarn has been locked down after being woven in. Its easiest to see this where the purple end is hanging-- the bump above is a doubled bump with the end woven in, and every other stitch preceding it also is doubled. 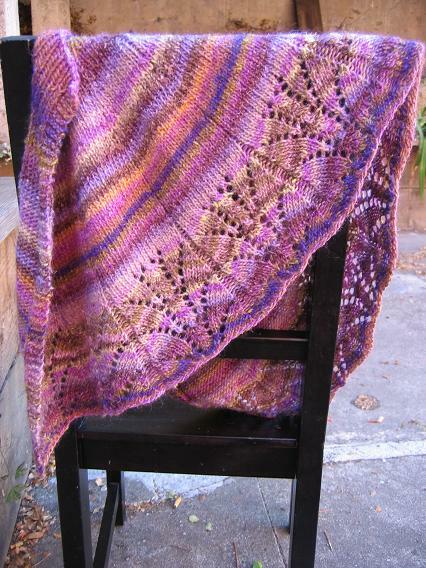 Purl back as normal. All of the weaving happens on the wrong side (WS), so you have to have the right side (RS) facing you as you weave in your ends so that they end up on the WS. No work happens on the purl back/WS row. Here you repeat the weaving steps, this time with the end of the new yarn (the black end that was left from when you added the new color). 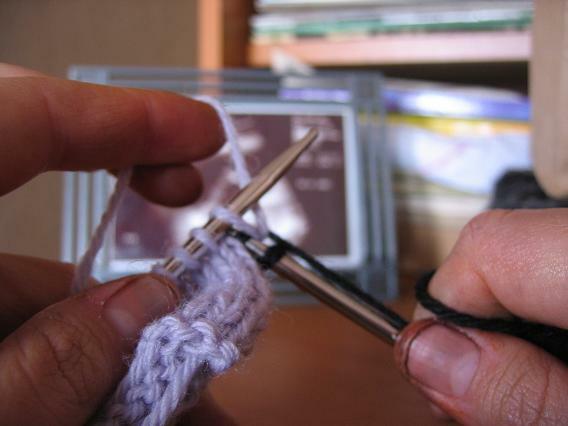 Knit 1st stitch on needle. 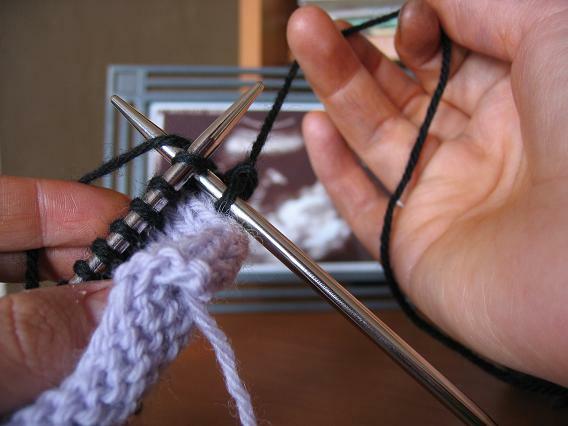 Holding end of yarn in left hand, lay it over the working needle in a counterclockwise dx. 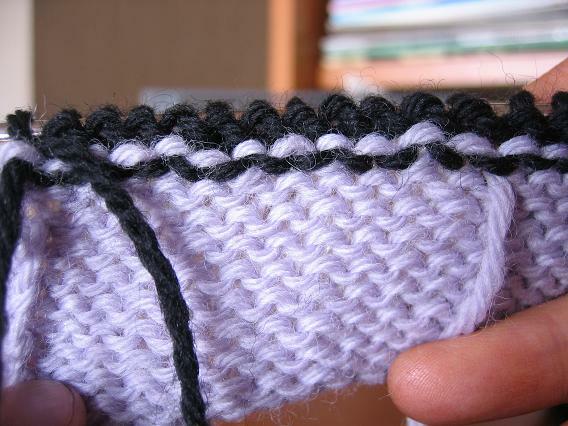 Knit stitch with end yarn draped over (sliding the working yarn under and catching the end yarn). 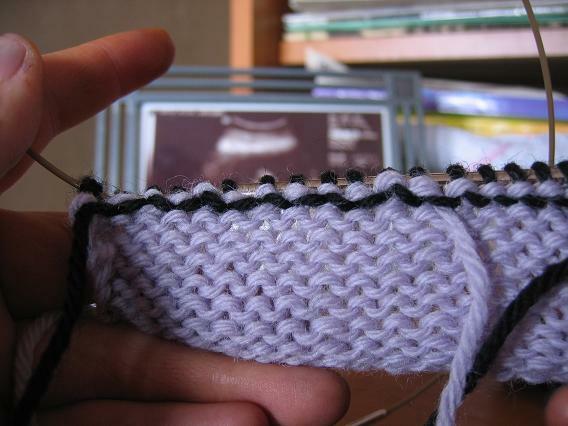 Knit 2nd "locking" stitch as normal. Proceed across row, alternating weaving & locking til end is woven in to your satisfaction. 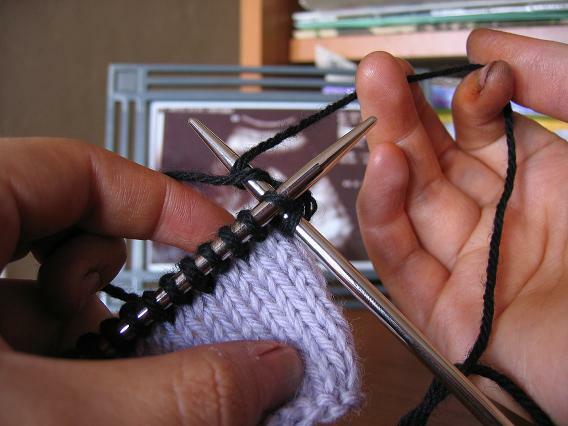 As above, drop end and knit across as normal. 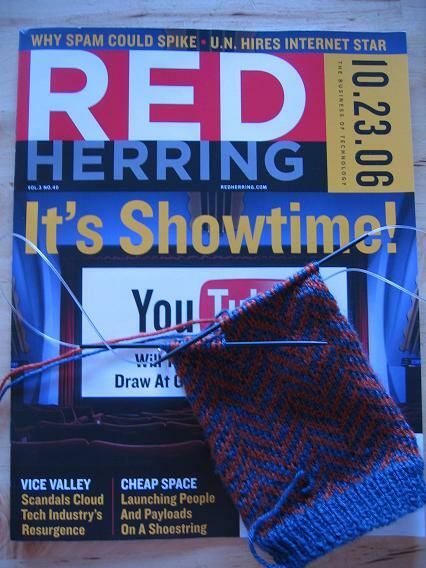 (WS after knitting across row & weaving in the end yarn.) Near to impossible to see the black yarn end woven in, but its there. 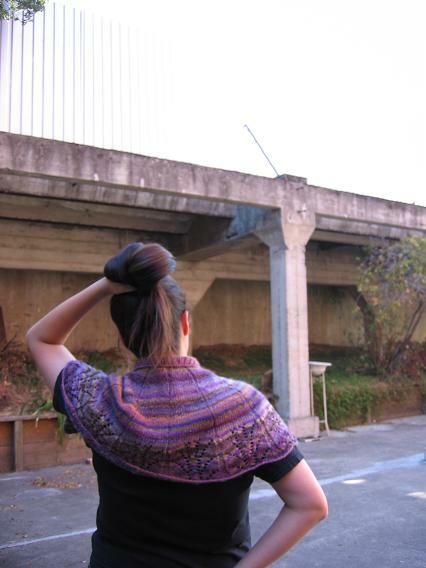 This is the RS after a few normal (non-locking/weaving) rows have been knit. 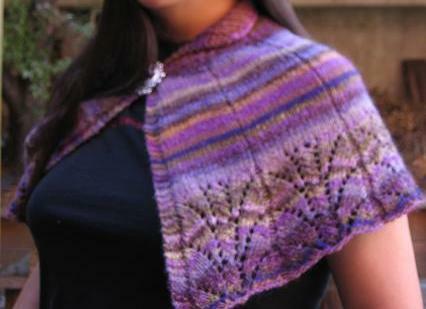 Note that you can't see the purple yarn thru the RS where it has been woven in. This is the WS after a few normal (non-locking/weaving rows). 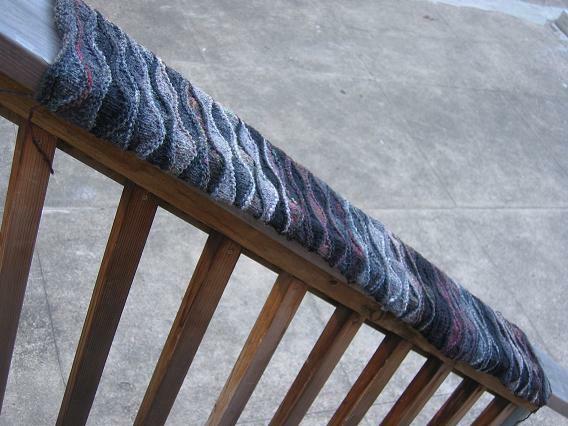 Again, you can't see the woven in ends, but you can tell where they are from where the ends hang. You can trim these to your heart's desire too. 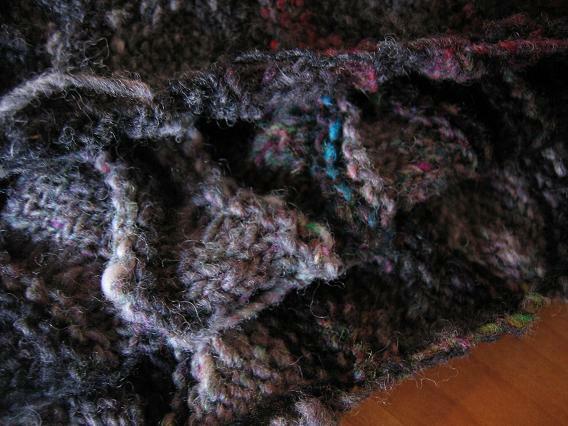 Nice, neat edge with ends woven in as I knit. Not sure how close I'll trim those ends once done. 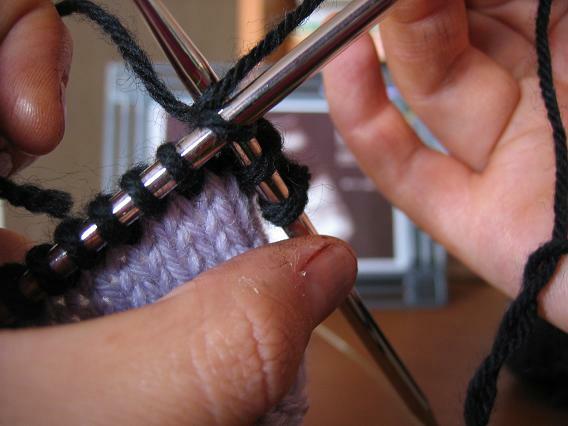 It may feel awkward at first to do, but you really get a hang of it and it doesn't take that long (and doesn't make me recoil like a darning needle does). I can see this technique opening up worlds to me-- I won't be afraid of stripes anymore, and as I am letting my fear of colorwork go, it will make the process more enjoyable as I won't dread the finishing. 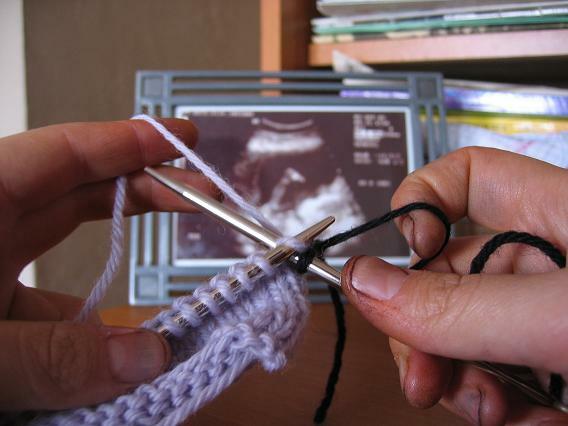 of carrots, horses, needles and yarn. 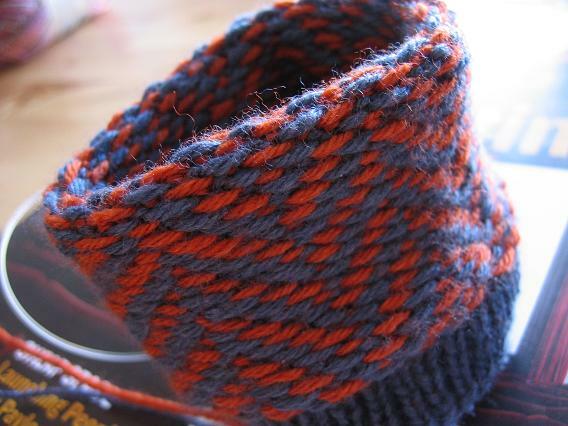 ...so I made a deal with myself that I could satiate myself on some selfish socks if I had finished up a few projects that woefully only needed finishing. Terrible pic, I know. Better ones found in lower links-- its hard holding a camera with your chin! :) Again, another "just needed finishing project." 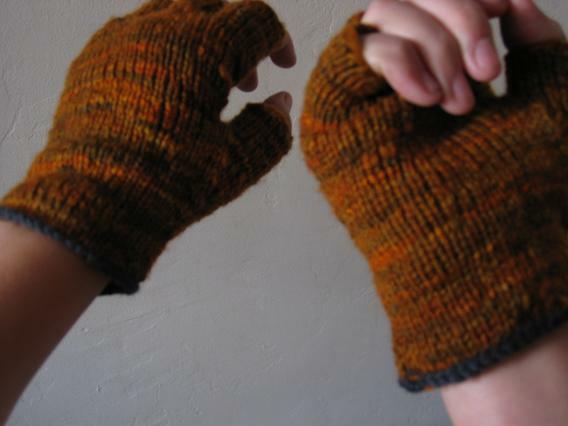 I ran out of the orange handspun to do a proper cuff with, so I knit one round in a black handspun of mine and did a regular bindoff for the little black edge at the cuff. I've decided to not embroider them, at least not right now, my skilz are sorely lacking and I kinda like the plain. As I wear them more as the weather cools, I may decide otherwise. Can I be in love with colorwork? Over, under, round & round... where I'll stop, nobody knows. I do wish the "turns" weren't as pocky as they are; they're not bad, but I can definitely see the "fold" where one needle ends and my latest goal is to figure out how to lessen it. Other than that, I think I'm the most surprised of all how nice and non-oddball the colorwork looks... like I said, I've tried it before and it was SO uneven because I thought it was "easier" to knit one color, drop it, and pick up another. 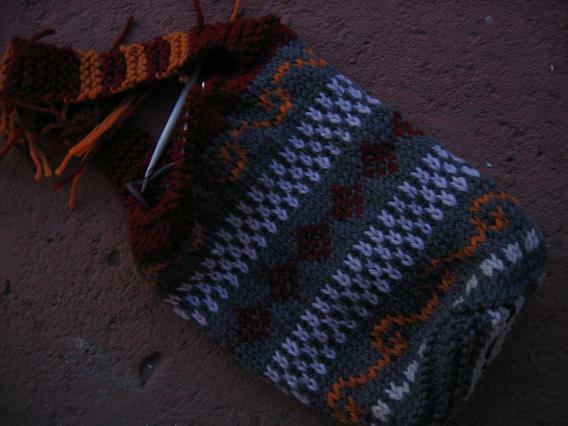 Now that I'm getting the hang of 2 colors in one hand and consistent in the over/under (pattern color goes under, background color goes over according to The Art of Fair Isle Knitting by Ann Feitelson), its greatly improved the tensioning.